--from David Wessel's gripping front-page article in the Wall Street Journal last week. It vividly cut to the heart of the real issues involved in the Fed bailout of Bear Sterns, and did by far the best job of highlighting what it all means than anything else published or broadcast anywhere that I saw. It proves once again why the WSJ is such a unique journalistic jewel, and why serious people remain so concerned about the fact that the Australian shark Rupert Murdoch now owns it. It should come as no news that we're in a housing slump of historic proportions. But the never-say-die realtor industry is intent on soldiering through the bad times by stepping up its subtle sales tactics. We thought this advice column from the Ohio Association of Realtors' website was a classic bit of flimflammery. This bit of laughable boilerplate sales coaching, right out of the movie Glengarry Glen Ross, is especially telling: "Listen carefully to the key words and telling phrases they (potential customers) use -- how they speak. Then subtly build those words and phrases into your conversations." We figure if you're going to have to deal with these sharks, it pays to at least bone up on their primitive tactics, before using it against them. The best defense, after all, is a good offense. My friend Maria Shine Stewart, a writer who teaches English at John Carroll University and maintains the blog Word Sanctuary Revisited, recently attended her first Nieman Narrative Journalism conference, at Harvard. We asked her to report on the experience, and she sent along this vivid dispatch. From the window on the Sheraton’s eighteenth floor, I could see the sequined streets of Boston, the faint blue line of the Charles River, and the domed roof of the Christian Science mother church. The last discovery reassured me that I had done the right thing in leaving for a writers conference—the Nieman Conference on Narrative Journalism--in the middle of a busy semester. Encountering a symbol of a movement dedicated to healing made me realize how deep my need for inspiration was. When logic fails, leave it to the signs. It defies reason and pocketbook to fly away to explore “Storytelling in Many Voices, Many Media” for even a few days for someone as tied to home and classroom as I am. And we had just had one of those terrible Cleveland blizzards, with so much snow that the airport closed. Adding flight anxiety to the list of reasons not to go, I reviewed conventional wisdom that it’s more hazardous on the ground—especially with piles of snow obscuring every turn while driving. And my coach-within reassured me that the weather would improve, my students and family would enjoy their freedom, and this conference featured first-rate speakers. Professionally, staying on the ground carries risks, too. Adjunct teachers don’t get sabbaticals; we must make our own time to recharge and reflect. Serving as muse to others is good. But can I still access my own creativity to write? The flight was one of the most beautiful I have ever experienced: endless blue and white, sky and clouds, water and snow. And when I landed in Boston, inexplicably, I felt like I had arrived home. First Day Highlights: After resting the day I arrived, I ventured out before registration. My walk to the Boston Public Library yielded a view of the Muses on the second floor, not far from an exhibit about a long-standing free speech forum. Facing History and Ourselves program had an interactive display about telling one’s own story. I learned about a Cambodian refugee to the U.S.—Arn Chorn-Pond--whose his life and family were torn apart by the Khmer Rouge regime. Told in video and words, his story reminded me of the suffering of children of war everywhere: each perspective unique, each story universal. Beyond the library, I walked as far as my feet would take me … past a beautiful park, a historic cemetery … and would have gone further, but I needed to head back to the hotel; it was almost time for the conference to begin. In the Welcome, Constance Hale, Nieman Center director, admitted: “Narrative journalism is an awkward Latinate expression …” More simply: Storytelling. Moving into the keynote speaker’s introduction, Hale said that John Hockenberry’s voice, as a public radio and former television journalist now serving at MIT in the Media Lab, is well known. Hockenberry shared stories from his professional life and a few private insights, too. He asserted that life in a wheelchair has added a parallel dimension to his reporting. He asked a question many of us might ask: “Where does my narrative intersect [the media narrative]?” During the first Iraq war, Hockenberry (carried by donkey) reported from perilous spots. “Reporters don’t really like to tell the back story,” he said, and reminded the group that colleges graduate three to four times as many public relations majors as journalism majors. He suggested that narratives are part of the internal culture of news organizations—influencing which stories are told and which are not.. And he offered the view that more “narratives find channels” in a multimedia environment. The February 2008 issue of MIT’s Technology Review summarizes some of his views on mainstream media in an article titled: “You Don’t Understand Our Audience.” Hockenberry’s new public radio program The Takeaway will launch in April on PRI. I ducked out of the Q & A session when I sensed that the first questioner wanted to debate–or clarify--whether multiple narratives was the right term (used by Hockenberry) or if a word like subtext would be better. I decided to stretch before the first breakout session and buy the CD of all sessions so I would not have to agonize over which of the 38 to attend. CDs are available to others, too. In “Putting the “I” in Writing” (about voice) magazine writer and memoirist Laura Fraser, author of “Losing It: America’s Obsession with Weight and the Industry that Feeds on It” and Mark Leibovich, national political reporter for the New York Times, talked about their work, with moderator Jeb Sharp. Fraser has had to shift voices for many audiences as a freelancer, “trying to develop my own voice while trying to be a chameleon.” She said that she only uses “I” when it sheds light on the “bigger story.” Leibovich said that he approached working at the Times with some trepidation—having worked for other papers--but that the “grand experiment” was working well so far. He stressed that, when reporting: “the situation is the star. I’m not the star.” “The Not-Dinner-Table Topics” (“race, religion, and other thorny subjects”) with Anne Hull, Alex Kotlowitz, and Marcus Mabry was moderated by Nell Lake and proceeded with professional examples of fine work. Mabry, international business editor of the New York Times (formerly with Newsweek), was raised poor and is African American and gay; he stated that this background gives him a certain “privilege” in approaching sensitive topics. He asserted that for narrative journalism “over-reporting is very important”—gathering more information than one needs, and then cutting back. Anne Hull’s comment that the topic of “gay marriage” is just as boring a topic as “marriage” drew laughter. An article she wrote about staying alive as a gay woman in the inner city required building rapport. Kotlowitz alluded to empathy as an important quality in writers—a topic he also explored in another session—but stressed that “I” has little place in the reporting he does. “If I’m in a Brooklyn deli,” he said, “channeling that subject so that their persona comes out [is the goal], not yours.” His book There Are No Children Here chronicles two young men living in housing projects; he said that he seeks out stories that otherwise might go untold. Two words were curiously absent in these sessions: creativity and inspiration. Yet, the speakers clearly were talented people driven to explore and express. They are artists. I skipped the evening documentary sessions. Tired, I retreated to my room to write. A city view from the 18th floor is invigorating and tranquil. I got to call maintenance when the sink faucet wouldn’t stop running. (Just like home.) Kept writing. Second Day Highlights: The first day I was surprised that attendees seemed to do little talking or networking compared to teaching and writing conferences I’d attended in the past. There seemed to be a collective retreat into cellphones and laptops at every break. The next morning I decided to seek out any friendly faces and intriguing nametags on Saturday morning and just start talking. The memorable Saturday-morning keynote “Creating an Investigative Narrative” (Walter Reed Army Medical Center) featured the teamwork of Anne Hull and Dana Priest on a story that broke in February 2007 in the Washington Post, exposing shocking conditions that some veterans must face. Priest stressed the importance of listening and patience while working on an investigative piece, gaining trust and access. She invited Hull to collaborate because she “looked like she was having more fun” as a writer. Their talk showed a complementarity that I suspect worked to their benefit. Their step-by-step description of what they did along the way is worthy of a chapter in a book on investigative journalism. Priest described the “the contrast between rhetoric and reality” of an institution like Walter Reed. “We tried to stay below the radar . . . [of] Army officials and editors alike,” she said. My, My, Memoir: The Promise, Peril, and Peculiar Challenge of Self-Revelation, featured Marie Arana, Lou Ureneck and Ayelet Waldman and was moderated by Anne Bernays. Ureneck, author of Backcast—a memoir about a fishing trip in Alaska with his son—is chair of Boston University’s journalism department and a 30-year newspaper veteran; he said that perfecting voice is a key to a good memoir. Arana, book editor at the Washington Post, said that memoirs should follow a narrative arc. She added that a tension was at work in creating her own book, American Chica; to her Peruvian dad, privacy about one’s life is the norm, but for her American mother, openness was all right. Bernays described a memoir she knew of in which so much was deleted, it was as bland as oatmeal. “You have to write from where it hurts,” she said. Arana said that most successful memories are ones that will “teach the reader something.” Ureneck added that good life stories can be appreciated for their language. All seemed to agree that the best transport readers to another time and place. Favorites mentioned were Growing Up, October Sky, This Boy’s Life, The Duke of Deception, Fierce Attachments, One Writer’s Beginning, Borrowed Finery, I Know Why the Caged Bird Sings, and Lost in Translation. Saturday afternoon I selected the session “Book Publishing, Soup to Nuts,” with Paul Bresnick (agent and former editor), Vanessa Mobley (senior editor, Penguin Press), Lou Ureneck (again), and Lissa Warren (publicist), skillfully led by Wendy Strothman (agent and former editor and publisher). It was a lively panel with a sample project making its way from book proposal to agent to editor to publisher to publicist. I thought I knew my fair share about book publishing--but this session focused on the marketing-oriented, strategic relationships every step of the way. More than a few in the audience had already had a book published, with varying sales. Key questions included: What am I uniquely positioned and qualified to write? Who should read it? How to market it? Ureneck mentioned the difference of being an author and a writer. He admitted that a long newspaper career did not prepare him for demands of book promotion. His own marketing has included a stand within L.L. Bean and a fishing convention. He is not afraid to take books with him on trips at his own expense to get word out. A simulated NPR interview showed him at work, plugging his memoir, Backcast. Among the third day highlights: Early Sunday morning I continued my quest to connect with a few new faces. Soon we were ushered into keynote “Cyberintimacies/Cybersolitudes,” where Sherry Turkle, a sociologist at MIT posed questions like: “Does digital life leave us more alone or more together?” I enjoyed hearing of her research, which includes interviewing people about their relationships with technology—or, as she prefers to put it, “devices.” She startled us with the possibility that robots might one day take on roles of watching the very young and the elderly if we’re not mindful. She cautions against exposing children to computers at the expense of human interaction. I asked a question about what she thought of the ability of cyberspace to free inhibitions of people so much at times—even into rage. Her response took into account the question: what serves the common good, plus a reminder that in face-to-face interactions, there are consequences to pushing boundaries or aggression too far. The last keynote was by Sam Pollard, professor and documentary maker, on “The Storytelling Impulse, from Shakespeare to Spike Lee.” Pollard revealed that he draws inspiration from reading and summarized his process of gathering over 100 interviews of people touched by Katrina, using no narrator or narrative in telling their stories but rather piecing together their words with powerful images and music. The excerpts he showed of When the Levees Broke were moving, a reminder that storytelling is also sharing history. Pollard is a warm speaker, one able to make you feel like he is speaking just to you in a crowded ballroom. The shortest farewell I’ve heard at a conference followed his talk; Constance Hale wrapped it up, simply saying: “Let’s get back to work.” Yes. Before heading to the airport, I went into the Christian Science church for a quick glance beneath the dome and then to the Mary Baker Eddy library (regrettably, closed). But I did see letters swirling on the floor of the lobby. I was happy to see a dance of words, a play of light, just as I was about to depart this place of inspiration. We've mentioned the New York Times' popular book blog, Paper Cuts (here and here). But until now, we've failed to note The Washington Post book section's blog, Short Stack. Last month, they noted five great overlooked novels by famous authors. We'd add one more to that list: Something Happened, by Joseph Heller, of Catch-22 fame. If you had to add one book to that list, which would it be? My wise and energetic friend Jeff Hess, who maintains a blog with the wonderful name Have Coffee Will Write, is taking a short break. So for the next few days, all you'll find on his blog is the brief, delightful message: "Gone thinking. See y'all Sunday afternoon." It reminded me of a wonderful point historian David McCullough once made on the Diane Rehm show: "People always ask how much of your time is spent researching and how much of your time is spent on writing? But nobody ever asks me how much time I spend thinking. And writing is thinking." Happy thinking, Jeff. To review earlier mentions of Jeff, go here, here, here and here. --poet Donald Hall. To learn more about the poet and his ouevre, you can go here. You can read the transcript of an interview with him and listen to an interview he did with NPR. Finally, you can go here to read a poem he wrote about his daily writing discipline. --the indomitable 88-year-old novelist and Nobel laureate Doris Lessing, in The Golden Notebook. To learn more about the life & times of the self-educated Lessing, who dropped out of high school at the age of 15, you can go here. Like all great writers, she resists classification. While many regard Notebook, published in 1962, as a pathbreaking feminist tract and its author as a feminist icon, she spoke out in this interview with the Guardian, saying "I find myself increasingly shocked at the unthinking and automatic rubbishing of men which is now so part of our culture that it is hardly even noticed." The Wall Street Journal's popular Deal Journal blog asks that question, pointing to a provocative article recently published in Foreign Policy magazine. Readers responded with waves of comments. What do you think? --the late Thomas Carlyle. The Victorian-era Scottish essayist, satirist and historian famously had a sacred respect for restraining speech until "thought has silently matured itself…to hold one's tongue till some meaning lie behind to set it wagging." He called it "the worship of silence." We think the media would have been much better off restraining itself for awhile rather than moving in lockstep, collective ignorance to turn the Eliot Spitzer story into something far more important than the facts warrant. But more about that soon. 'Decades of use by people not known for fastidious habits had given the room a patina of grime. The desks, scarred with cigarette burns and mottled with coffee stains, were shoved together, and the air was thick with smoke. In summer it was circulated but not noticably cooled by ancient fans with black electrical cables that dangled to the floor. There was no air conditioning, but we would have scorned it anyway. We were newspapermen, conditioned to discomfort, reared on movies like The Front Page, in which gruff men wearing fedoras barked at each other in sentences that moved as fast as bullets. I thought it was the most beautiful place in the world. Not everyone was as charmed by the environment. A copyreaders named Mike Misselonghites, who sat along the rim of the horseshoe-shaped copy desk, arrived at his post a half hour early every day. He would take off his coat and walk to the men's room, where he soaked and wadded up an armful of paper towels. Then he brought them back to the copy desk and scrubbed his area of the desk. Then he scrubbed his telephone and its cord. Then he lifted his chair onto the desk and scrubbed its seat and back and legs, not resting until his workplace was free enough of dirt and bacteria for him to safely go to work. Nobody gave Mike's daily ritual a second thought, just as nobody was surprised when the absent-minded music editor, Francis D. Perkins, who often smoked his pipe upside down, started a fire in his wastebasket. It was a community of mavericks and oddballs, held together by the common purpose of our daily voyage, equally hospitable to the portentous political columns of Walter Lippmann and the high-society gleanings of Lucius Beebe, the legendary fop, who arrived for work in midmorning, after a long night of prodigious intake at the Stork Club and El Morocco, immaculately turned out in a derby, a bespoke suit, and a magenta shirt with a white silk tie, his gold watch and chain suspended from a figured vest. Much has been written about the Herald Tribune's bright stars in those postwar years: the foreign editor Joseph Barnes, the foreign correspondent Homer Bigart, the city reporter Peter Kihss, the sports columnist Red Smith, the Pulitzer Prize-winning photographer Nat Fein, the music critic and Pulitzer Prize-winning composer Virgil Thomson, and many others. But the paper never forgot that its readers were an infinitely mixed stew of interests and curiosities, and it had experts squirreled away in various nooks to cater to their needs: the food critic Clementine Paddleford, the fashion columnist Eugenia Sheppard, the stamps editor, the crossword-puzzle editor, the garden editor, the racing columnist Joe H. Palmer. 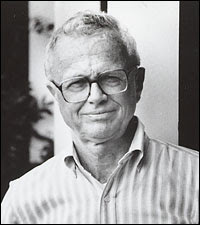 --from a book now in progress by William Zinsser, a memoir of places where he has worked as a writer and a teacher. When completed, it will be his 18th book, and possibly his best yet. To review earlier mentions of the immortal Mr. Z, go here, here, here and here. Here's a freshly published review I wrote of a new book by a father-son reporting team, Lou & Carl Cannon, that explores the question of the extent to which George W. Bush's presidency has either furthered or hindered the goals of his hero, Ronald Reagan, and his so-called Reagan Revolution. In the review, you'll find a passing reference to a great book on the current Iraq conflict, Fiasco, by Thomas Ricks, who appeared in Cleveland last Sunday at an event at the Cleveland Public Library. You'll find my earlier reviews for the Monitor here, here, here and here. The Nation parachutes in a writer from New York, who sends back "Postcards from Ohio," which shows some evidence that despite her ethnic surname, she doesn't understand Ohio terribly well (it's Brookpark, not Brook Park). But on a deeper level, it misses the mark because it seems to assume that Ohio is only a manufacturing center. It is, but much more than that too. On the other hand, its perennial rival,The New Republic does a good dissection of Ohio, breaking down the polls, demographics and recent dynamics. The best line: Union-dominated Youngstown "still has the feel of New Deal-era America." Meanwhile, the National Journal's Ron Brownstein, a long-time fixture at the L.A. Times, and considered by many (including me) to be among the best thinkers and writers on politics, offers this smart take on how the Clinton-Obama shootout is fundamentally transforming the Democratic party. Finally, this pair of Congressional Quarterly correspondents offers a video postcard of their Ohio coverage tour. Anyway, we thought all of these were must-reads/must-watches as Ohioans head to the polls today. Or at least those who haven't already voted absentee. I can't remember an election in which more people happened to mention that they had voted absentee than this one. I suppose it may have something to do with all the coverage of the poll complications. Meanwhile, the Ohio-based company that makes the infamous problematic voting machines, Diebold, just received an unsolicited takeover offer. With the tight and dramatic race for the Democratic presidential nomination attracting unprecedented interest from the global media, hundreds of reporters from around the world are competing for every scrap of information they can find to write about. With the attention recently having moved to tomorrow's Ohio primary, the hunt for scraps moved closer to home. Last week, two leading British-based publications published interesting looks at Cleveland. The Economist weighed in with a typically smart look at what the Cleveland Clinic's success means for the area's economy, comparing it with another extremely successful hospital, the Mayo Clinic in the Twin Cities. In the process, it made the interesting observation that as host to three million visitors each year, the hospital system is beginning to take on the characteristics of a hospitality organization. It also noted that when two major buildings are completed, the complex will be twice the size of the Pentagon. The Rupert Murdoch-owned Times of London, meanwhile, offered a bleak look at the subprime crisis's effect on Cleveland, likening it to the devastation Hurricane Katrina visited on New Orleans. Not a terribly original observation, of course, but then, Murdoch-owned media are not known for their originality. There's a good reason why smart Baby Boomers are increasingly moving to college towns for their active retirement years: there's so much to do and see there. Nearby Oberlin College is a sparkling case in point. Whenever I take a look at their website, I seem to notice a nationally noted speaker appearing on campus, and the programs are always free and open to the public. This month, in fact, there are three speakers worth seeing (I plan on making it to at least one of these events). This week, the incomparable storyteller Robert Krulwich, an Oberlin grad, will appear. Next week, it's former Bush speechwriter David Frum, infamous author of the "axis of evil" line from a George W. speech. Finally, on March 19th, former Clinton Labor Secretary Robert Reich makes an appearance. Krulwich, a longtime NPR guy who also spent some years at CBS and ABC, is easily among the two or three most innovative storytellers in the electronic media. His distinctive style is as entertaining as it is informative. And we like the diminuitive Reich for his habit of truth-telling. As for Frum--well, we could do without him. --from Deborah Tannen's remarkable chapter in the new book, Thirty Ways of Looking at Hillary--Reflections by Women Writers. We think the Georgetown University linguist, who specializes on the different ways men and women talk, listen and interpret the world, is one of the most consistently enlightening authors we encounter, and someone who wonderfully bridges the gap between academia's normally jargon-laden gibberish and clear writing for general audiences. We could use a thousand more like her. You can learn more about her here, and to check out all of her books, go here. 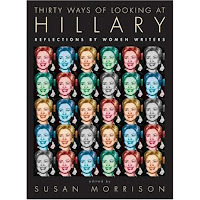 UPDATE: Former Wall Street Journal book editor Manuela Hoelterhoff, now with the Bloomberg news organization, interviews the book's author, Susan Morrison.